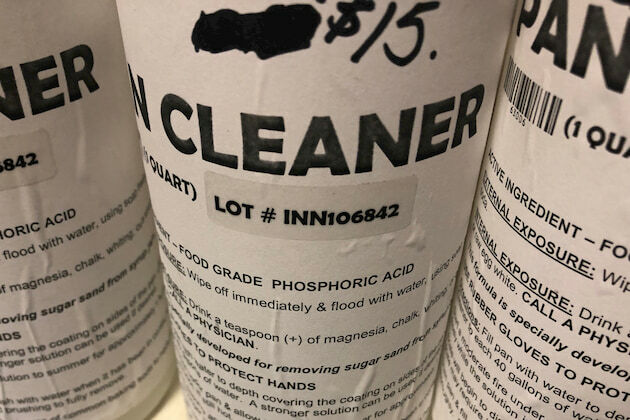 Vermont regulators are looking to create new rules for "wastewater" runoff from sugarhouses, in particular pan cleaners containing phosphorus acid. MONTPELIER, Vt.—Vermont regulators are targeting sugarhouses as their next jurisdiction of water protection rules. “We will be going going around collecting data and finding out the levels of concentration coming out of the waste at sugarhouses,” said Patrick Fry, Agricultural Engineer, Vermont Agency of Agriculture, Food, & Markets (VAAFM). Fry said he won’t be writing the laws but will be making recommendations to the rule makers that do. “I’m going to be talking about ways they can be alleviating concerns that I personally have,” Fry said. He was a featured speaker at the Vermont Maple Schools in January. At issue is the so-called “waste” Fry says is coming out of the big-time sugarhouses in the state and making its way into major waterways like Lake Champlain, Lake Memphremagog, the Connecticut River, Lake Carmi and other water sources. Fry claims that the biggest culprit is pure phosphorus from pan cleaners mixing in with the permeate discharge which then merges into a channel and makes its way directly into those water bodies. “When sugarmakers are using pure phosphorous to clean pans and dumping out the back of the sugarhouse in the season, that gets into the water,” Fry said. Phosphorus is a big regulatory target for the Environmental Protection Agency. They claim that phosphorus from agriculture, in particular dairy farms, has gotten into water bodies, suffocating the oxygen in the lake, helping to generate blue green algea which in turn causes more oxygen depletion. Fry has been working with dairy farms in Vermont to mitigate the problem. He came onto looking into maple in 2016 after a citizen complaint that a private drinking water well was contaminated by runoff from a nearby sugarhouse, less than one mile away. There were no regulators looking at sugarhouses before then. Fry says that, after investigating the industry for two years, he will be recommending that sugarmakers “capture” all of their water that is used for pan cleaning and store it for the season and then spread it on dry ground in the summer. Last year Fry studied the runoff from four sugarhouses and said he found direct evidence that pan cleaner discharge was merging with permeate discharge and creating a channel that ended up in surface waters. “At every location I’ve been able to see that water mingle into a stream,” he said. “There were clear spikes in phosphorus,” he said. This season he plans to inspect ten more sugarhouses. He said the sugarmakers were voluntarily cooperating with his study. In the end, he will be making his recommendations to the higher ups at the Vermont Agency of Agriculture and Agency of Natural Resources. From there, new rules and regulations are expected to mitigate the runoff, he said. Meanwhile, Fry has been going around the state and talking at the Vermont maple schools for the past two years, trying to educate sugarmakers and get them to make a voluntary effort to keep pan cleaner runoff from leaving the sugarhouse. Maple operations are eligible for state funding for mitigation efforts, up to 90 percent of the costs.